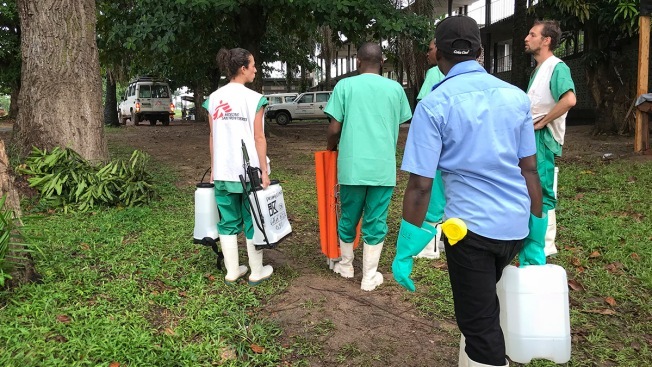 In this Sunday, May 20, 2018, file photo, a team from Medecins Sans Frontieres (Doctors Without Borders) carries protective equipment as they prepare to treat Ebola patients in an isolation ward of Mbandaka hospital in Congo. Another person has died in Congo of a confirmed case of Ebola, bringing the number of fatalities to 12, said the country's health ministry. Congo's health minister Saturday flew by helicopter to Bikoro and Iboko to see the deployment of health workers who will be tracing those who have been in contact with Ebola cases and inoculating them with a new experimental vaccine. Health minister Oly Ilunga was accompanied by representatives of the World Health Organization and UNICEF. The vaccination campaign in those rural is to begin Monday. The vaccination campaign is already under way in Mbandaka, where four Ebola cases have been confirmed. About 100 health workers have been vaccinated there as front-line workers face high risk from the virus, which is spread via contact with the bodily fluids of those infected, including the dead. The next few weeks are crucial in determining whether the outbreak can be brought under control, according to the World Health Organization. Complicating factors include its spread to a major city, the fact that health workers have been infected and the existence of three or four "separate epicenters" that make finding and monitoring contacts of infected people more difficult. Associated Press writer Geir Moulson contributed to this report.